What wouldn't you do #withoutProtection? Success of the last Hashtag challenge, available across the social media platforms, convinced us to continue with this idea. This weekend, we want to introduce you to a new one. 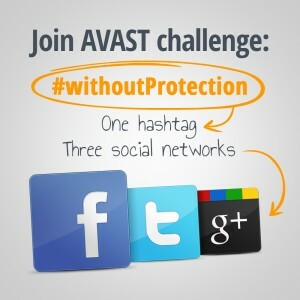 Utilize the following Hashtag: “#withoutProtection” to let everybody know what would you never do #withoutProtection. :) Would that be: sunbathing, travelling, leaving your kids, or maybe risking to leave your PC #withoutProtection…? :) Be creative, be funny, be free. Additionally we will award the most liked (on Facebook), most Re-Tweeted (on Twitter), and most +1 messages on Google+ recommendation, so don’t forget to invite your friends to vote for yours! Note: Due to current linguistic capacity of AVAST Social Media team, we have to limit our hashtag challenge to the English language. Soon other languages will follow.